“What is this life if, full of care, We have no time to stand and stare” Is what William Henry Davies rightly said in his poem “Leisure” With the hectic academic year coming to an end, it was time for us to take a moment to gaze and appreciate what our tiny tots had accomplished this year and they also gave us more than just a moment when we could link our soul to the fair works of nature. The earth has music for those who listen and the sweet voices of our preprimary children filled our hearts with the magnificence of nature. The little ones replenished our memory of the loveliest things of beauty, god has ever created. In the musical journey, we had songs of the birds, chants of the ocean and hymns appreciating the splendor of nature. Our comperes were students of Grades 3 and 4, the nature’s guides who took us on the mesmerizing adventure. The Children from our Montessori showed their love and reverence to the creator for having given us such a bounty- in the colours of the rainbow, the beauty of the flowers and fields, the vast expanse of the sky and the trees, the most valuable gift from nature to mankind.. The Theme the KG 1 had chosen to represent was ‘BIRDS’. They reminded us that birds are important to you in many ways and sang the all-time favourite the Kookabura song, ek tha chidiya and a few more. Then came the children in blue shimmering costumes. Yes! It had to do with the ocean!. From dolphins to crabs and jellyfish to lobsters, the ocean is brimming with life in many forms, colours and sizes. Corals, reefs, seaweed and sea shells lend the big blue ocean even more of an enchanting appeal. It was time to dive under the sea and see what the slippery fish and the funny fish of KG 2 had to present. The message for the evening was loud and clear: The world has so much beauty; don’t let it pass you by; Stop for a while, look around, enjoy with the dreamy eye…; Listen to the sounds of Nature, music that can soothe you forever. The programme ended by congratulating the little ones graduating from KG2 to grade 1. As they were ready to move on to the Primary, something that everyone wished for them was: Good, Better, Best; Never let it rest, Till the Good is Better, and the Better, Best! The tiny scholars then received their certificates from Shubha Ma’am and there were 2 catchy songs performed by the dynamic group before calling it another Fruitful Year! “Accoladay 2014-15” on March 9 was a very special day for us as we honoured our students for their achievements through the year. This year was more special than last year as the school introduced beautiful lapel badges for all the prize winners along with medals for sports and certificates for all. School days can never be complete without a little bit of sporty excitement, a bit of adventure and painting, dancing, singing and art. Inter-house and Primary competitions like pick and speak, block and tackle, JAM, rap writing, public speaking, sports and various other competitions in various areas develop students’ interpersonal skills so as help them be confident and well-adjusted individuals in their future. Accoladay 2014- 15 saw non-scholastic prizes for the 50 plus inter-house competitions for grades 6 to grade 11 and over 35 primary competitions held for grades 1 to 5 giving plenty of opportunities for every child to shine in his chosen sphere. Academic proficiency for grade 11 students who will be stepping into Grade 12 was also awarded. 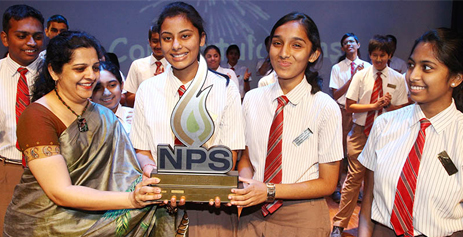 The champions in academics were Saloni Wadhwa-Biology topper, Kaustub Keshava – Math topper, Milan S Bidare – English and Computer Science topper, Abhijay Singh – Topper in Physics, Chemistry, and also Science Stream topper. Rohit Iyengar – topper in all subjects of Commerce, stream topper in commerce as well as the Batch topper for the year 2014-15. Pranavi S Urs who is the reigning top golfer of India in Category C was felicitated by the Principal Ms. Shubha Achaiah on her already stupendous golfing career and encouraged her to do her best! ’Challengers’ one of the four school houses won the champions trophy 2014-15 for the 2nd consecutive year, headed by Tanishka Darla and Nikitha Srikanth.v Antara of Grade 7 walked away with the most number of prizes this accoladay with a grand total of 13 awards. The school also had a new category of awards for the best class under various categories. The Grade 1 babies were the proud winners in the primary section, Grade 8 won the best class under the middle school section and the Grade 11 students were given special recognition for being positive role models for everyone in the school. Some of the best talents around the world attribute extracurricular activities as the roots for their academic and career success and we too move forward with the same belief and are happy to provide such an interesting learning atmosphere at NPSI, Mysore. 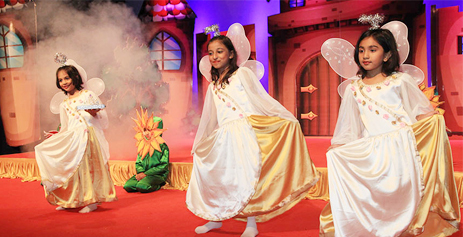 27th February 2014, Friday at NPSI Mysore, the magic began as the pre-primary children stepped on stage and wowed the audience before them. It was indeed as if a magician his wand around to say ABRACADABRA and parents and teachers alike were transported off to their charming and innocent worlds. Through the magic of Abracadabra, these tiny tots show cased their talents, be it in speaking, singing or even shaking a leg. From traversing into space and then diving into the deep blue sea the Montessori children had the parents spell bound. The KG1 children then led their audience on to explore the amazing world of transport. . From the rail and road and then whizzing off in the air, these little ones made sure to take the audience for an enjoyable trip all around. Children then whisked everyone off into a farm with hens, cows and piggies galore. The singing and dancing was made all the more enjoyable with their lovely costumes and the mesmerizing decor that made it look like everyone was actually at a farm. The final set of KG2 parents were in for a treat as children proved to be Little Einsteins indeed. Astronauts took them for a spin around the galaxy safely bringing them back to earth. Parents then parted for the day with a message from the children urging them to save Mother Nature and Go Green! 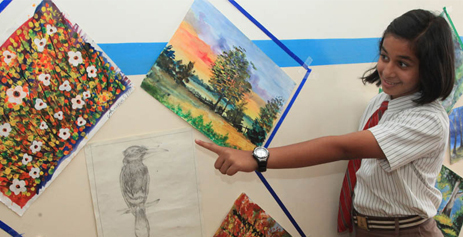 Nirmiti 2015 an expression of creative skills through art was an exhibition to cherish. Warm smiles and vibrant colours greeted parents at NIRMITI in NPSI, Mysore. It was a riot of colours decor, splashed on the walls of NPSI. This is the first art and craft exhibition of NPSI Mysore, which left the visitors spellbound. Students displayed their creative work very artistically. Craft work was imaginative and simply amazing. They did it with great interest and enthusiasm. It was a show which opened our eyes and awareness to the beauty of nature and simple patterns constructed in the world around us. Children explained with poise about every painting and craft displayed. Their experience while creating an art piece explained by students made visitors watch and listen to them in awe! Visitors admired the idea of bringing together energetic group of children to generate art and see what possibilities of creation and collaboration can be brought amongst them. Parents were mesmerised with the work and also appreciated and gave encouraging comments like “we have landed in a colours of heaven”. January 30th – Martyr’s Day- was observed in the school with great reverence and gratitude. The school paid tribute to the country’s brave heroes who gave up their lives for the welfare and progress of the country. The day started with the rendering of ‘Vaishnav janatho’, Gandhiji’s favourite bhajan. This was followed by the song of the BSF, The Border Security Force, which reiterated the courage of our brave soldiers guarding the borders of the country against incursions by the enemy forces. The significance of 30th January being observed as Martyr’s Day was told, with strains of ‘Raghupathi Raghav Raja Ram’ being played in the background. The students of grade 7 enacted a skit to highlight the valiant role played by so many defence personnel and ordinary people during the terror attack in Mumbai on the 26th of November 2008. The skit, through the depiction of the roles played by these brave people brought home the fact that heroes aren’t extraordinary people, but ordinary people, displaying extraordinary courage in times of distress. The students expressed their gratitude to all the Defence personnel who continue to relentlessly lay down their lives for the security of the Nation. They have given up their today’s for our tomorrows. Thank You, Brave hearts; we salute you. 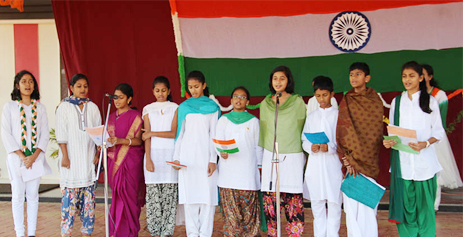 The 66th Republic Day was celebrated with great enthusiasm and patriotic fervour in the school. 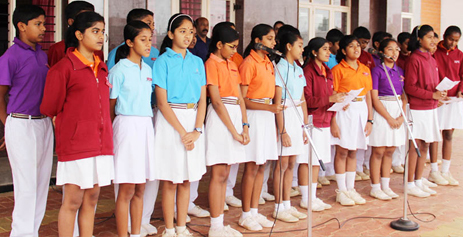 The programme began with the flag hoisting by the Principal Ms Shubha Achaiah followed by the rendering of the National Anthem by the whole school. The students of Grade 6 sang a patriotic song saluting the mother land after which, the gathering was enlightened about the significance of the Republic Day and the reason behind its celebration. The meaning of ‘Republic’ was elucidated, as also the importance of the Constitution. Students dressed as some of India’s courageous freedom fighters like Jhansi Lakshmi Bai , Baba Saheb Ambedkar, Kittur Rani Chennamma, Mahatma Gandhi and so on, gave the gathering a glimpse of history through their eyes. Their struggle and their sacrifice was painted vividly through the poignant speeches delivered by the students. The co-ordinator, Ms Gowri spoke to the gathering highlighting the values one should emulate from the lives of our great freedom fighters and urged the students to take a pledge to work hard and contribute to the progress of our country as they were the flag bearers of the future of this great Nation. The programme ended with the whole school echoing with a resounding ‘Jai Hind’. Everyone dispersed with sweets in their hands and the pride of being an Indian in their hearts. VITAAN 2015 a day in NPSI Mysore, where the audience were transported to a land of enchantment and magical wonder, a world of fantasy and marvel, replete with castles, princes and princesses, witches and fairy godmothers, angels, genies, giants and dwarfs, and circus-animals and elves – stories with simple, yet valuable messages for life. Grade one students performed a captivating musical on friendship, a lovely virtue to possess. Oh! So beautifully enacted! Grade two, with an incredible delivery of medley with dance and play, portrayed the meaning of compassion, which extends beyond consideration of human life, and to treat animals with empathy. Grade three entered into candyland full of jellies, marshmallows, candies, lollipops and gummy bears learning to share, while grade four enacted a play to depict gratitude, where the wicked witches gave a thrilling dance performance that brought out the advice “never let the things you want, forget the things you have.” Grade five’s splendid performance on keeping promises with the meaningful story of pied piper gave the audience food for thought. The finale was a conjugation of all the wonderful virtues portrayed. It was a delightful evening where students of grades 1 to 5 at NPSI Mysore, were the harbingers of friendship, compassion, sharing, gratitude and keeping promises which, together kept the packed auditorium in a truly fairytale world. Pongal / Sankranthi was celebrated with great enthusiasm on the 14th of January. The school wore a festive look, with Mango leaves and yellow chrysanthemums decorating the entrance and the traditional Rangoli welcoming the students in the front office area. As part of the celebrations a Rangoli competition was held for students of VI, VII and VIII to display their creative talent. The students got a glimpse of celebrations of Sankranti in the villages – the games played – ‘Kunte-Bille’, ‘Pagade’, ‘Allgulli Mane’ were displayed. Fresh harvests of crops like Paddy and Ragi were piled along with fresh Sugarcane fronds. 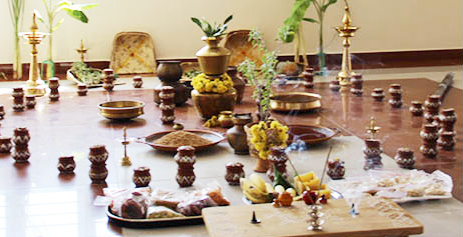 All the new harvests were arranged around the ‘Pongal Pot’, which was decorated intricately. The significance of ‘Pongal’, ‘Sankranthi’ and many customs followed during this festival was explained to the students. The different celebrations on the three days of Pongal, the custom of distributing Til, to friends and well-wishers were described and explained. The importance given to Nature – the crops, the sun, the cattle, the birds, through their worship on the three days of Pongal was stressed upon – Our Ancestors recognised the vital role Nature played in the progress of mankind and respected Nature for it. Today, through the celebrations of festivals, we are following the ancient customs and thereby, giving Nature the importance it deserves. 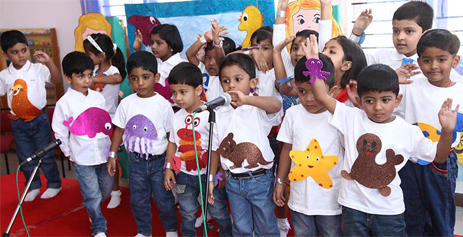 The teachers sang a ‘Suggi Hadu’, and performed a ‘Suggi Kunitha’ much to the enjoyment of children. How could one forget the 23rd of December as it marked the beginning of the Christmas celebration? It was a cold winter morning, but it was festive time inside the portals of NPSI, as the school and the classes were decorated with bells, mistletoes, stockings, stars, Christmas trees and many more. To top it all, at the gates of NPSI we could see students wearing the Santa cap to bring in the feel of Christmas. 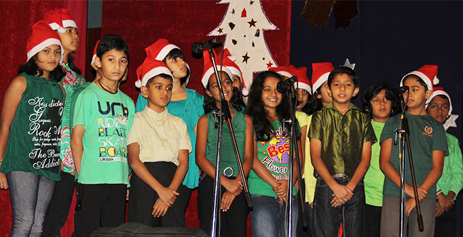 There was excitement as music filled the air and the grandeur of Christmas celebrations began. A beautifully voiced narration was given by two of our students about the importance of Christmas celebration. It started with the choir singing popular carols like Silent Night, Gloria, Joy to the World and other interesting ones. To mark the importance of Christmas, the nativity play was enacted by the students of grade 4 combined with a shepherd dance and an angel dance which added more colour to the programme. Teachers too performed the dance “Salsa Shine”. It was a big surprise to all the children and they enjoyed it thoroughly. Following this was the scintillating performance of the fifth graders with the “Jingle bell dance.” The programme would have been incomplete if our esteemed guests from the North did not come. The auditorium was filled with boundless joy and happiness on the arrival of the Santas. They received a standing ovation from all the surprised little hearts. The Santas went to each class and met the children and gave them chocolates to mark the occasion. Everyone wished each other a Merry Christmas and parted happily for their Christmas vacation. 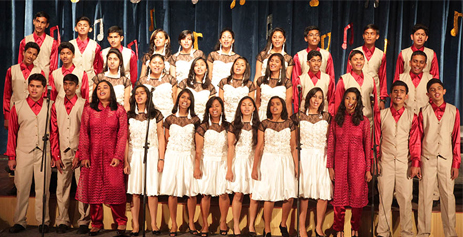 The musical soiree Ninaad 2014 was an evening of mesmerizing music. There was a pleasing plethora of music for everyone in the audience… for each one to relive their own Golden era of music as they were taken through a melodious journey down memory lane. The grade 6 students presented the ‘The Groovy 60s’ with their petite dresses and jazzy shirts singing the songs of Elvis, Bee Gees andother vintage groups. Then came the age of the Boney M and Abba and the audience were treated to classics that never go out of style. The Grade 7 students sashayed in with bellbottoms and floral prints, with large shades and afro wigs transporting all to the era of ‘The Hippy70s’. It was then the turn of “the Electric 80s” for those fans of the decade that brought us hair bands, new age music and everything in between, the fans of Michael Jackson and Madonna. A glimpse of the nostalgic 90s when hip hop gained its spotlight was then offered by “the Pop Club 90s,” the 9th graders. The favourites here were Another Day in Paradise, Bonita, Boyzone and more. Then came the pop culture in 2000’s when pop was extremely popular. The smashing 11th graders portrayed “the Hiphop 2000” giving everyone a complete essence of teen pop culture! The core-group capably supported all the cluster of singers bringing in the harmonics to the melody of the songs. They also rendered the soul stirring Acappela and the Finale song, “Thank you for the Music” superbly led by YuvikaBalaji, Meenakshi and Rhea Heri. The whole event was beautifully emceed by the sassy 4: Ahmed, Rohit, Sharon and Nishi from the 11th who spoke, acted, danced, rapped and completely enthralled the audience with their zing and attitude. NPSI, Mysore holds the Young Entrepreneurship Programme every year, a very unique programme conducted to instil the spirit of innovation, ownership and to give them a hands on practical understanding of what it takes to be an entrepreneur. This year too, it was a grand success, with the concluding market day having 18 stalls put up by Grade 6 and Grade 11 commerce students. There were stalls selling terracotta garden accessories, quilling/ crystal/ kundan jewellery, bookmarks, greeting cards, painted dinner/ tea napkins, woollen vases, posters, badges, vases etc along with yummy foods like smores, cupcakes, marshmallow fondues, Monaco sandwiches etc. The parents were also generous and encouraging customers as showed appreciation and participated wholeheartedly. The whole experience starting from coming up with one of a kind product, convincing investors and raising resources, executing the product flawlessly, marketing them persuasively and engaging the customer passionately are some of the learning that they derived from this exercise. The profits raised of course from the programme will be given to charity. The theme for the market day was purple which was striking and gave the entire ambience a very lively and royal look. 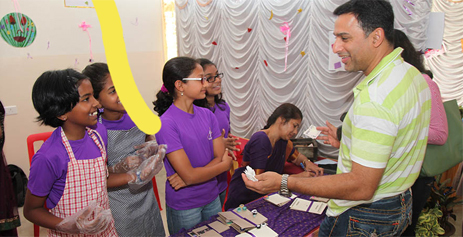 Children wore YEP t shirts made for the occasion, the invite- a pretty little money bag with purple rupee sign on it, the purple packaging of all the products and the purple decorations all around added to the purple magic. The best teams were judged by few of the customers on their products, their marketing and the overall presentation. They were awarded with a special memento designed for the event.